The first tap of a maple tree is a sure sign that spring has sprung in southern Ontario. Students at Wilfrid Laurier University’s Brantford campus can explore the history of maple syrup during a workshop and pancake meal on March 27. 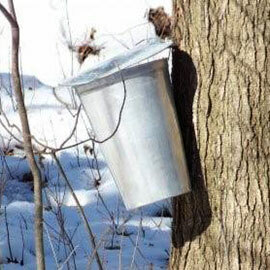 Laurier International and the Office of Indigenous Initiatives have teamed up to offer a sugar bush trip to Mohawk Seedkeeper Gardens in Six Nations Grand River Territory to connect students with the surrounding Indigenous community and experience the Indigenous process of producing maple syrup. The event is hosted by Terrylynn Brant, a Six Nations traditional seed keeper. “We hope to provide a cross-cultural experience between students and the local Six Nations population and to provide the Indigenous pre-contact history of maple syrup, which is rooted in Indigenous antiquity,” said Bonnie Whitlow, Indigenous special projects officer at Laurier. Six Nations artisans will teach students to identify sugar maples in winter as well as how to tap a tree and collect sap. Participants will learn about the process of turning sap into maple syrup and help clean up the sugar bush as an exchange for the knowledge they received. Laurier’s Elder in Residence, Norma Jacobs, will describe the Indigenous ways of using maple sap as medicine and for ceremonial practices. Following the workshop, the Indigenous Student Centre will host a pancake meal, providing participants with the opportunity to taste the maple syrup and to learn more about the services offered by the centre. The free event takes place from noon to 4 p.m. Register at the Laurier International Office, Dalhousie Centre, 274 Colborne St., Brantford. Transportation will be provided from the Student Centre.